I'm a big fan of reading. I'm a big fan of reading books that affirm my beliefs, but I'm also a big fan of reading books that challenge my beliefs and stretch them in different directions. I love sharing ideas and thoughts and seeing the world from a different angle, because I firmly believe that we can't learn and grow and progress if we never step outside our comfort zones, if who we currently are and what we current think about the world around us is never contradicted or questioned. Every year, during the last full week of September, the American Library Association and the entire book community celebrate and highlight the importance of "the freedom to seek and express ideas, even those some consider unorthodox or unpopular". Lists circulate of books that are frequently challenged or banned and I always find several books on the list that I really enjoyed reading and found valuable. 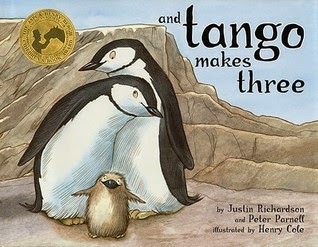 So, for example, on this Buzzfeed list, I've read And Tango Makes Three and I thought the treatment of this true story was sweet and adorable with beautiful illustrations. I read The Old Man and the Sea by Ernest Hemingway in high school and was profoundly moved by the stark and evocative prose telling of pitiful old Santiago battling the magnificent marlin. Nickel and Dimed by Barbara Ehrenreich forced me to reconsider some of my prejudices and preconceived ideas about poverty and the poor. Persepolis masterfully portrayed life as a young girl in Iran during the Islamic Revolution while distilling thousands of years of Persian and Iranian history into a readable narrative. I was surprised by how touched I was by The Absolutely True Diary of a Part-time Indian by Sherman Alexie. The teenage protagonist's hopeful and optimistic view on life despite all the crap he'd been through was nothing less than inspiring. And for Pete's sake, I put both Fahrenheit 451 and A Wrinkle in Time on the list of the most influential books in my life! The ALA compiles lists of the 10 most challenged books every year. And the 100 most challenged books of the past two decades. And the most frequently challenged authors. There's a plethora of lists of "subversive material" here. Listen to this 3-minute story on NPR about some frequently challenged comic books, particularly Captain Underpants, which topped the list of the most frequently challenged books in 2013 according to the ALA. And make sure you check out the great graphic that illustrator/author Dav Pilkey drew specifically for Banned Books Week. And just for fun, take a look at this guide to children's classics that might have you taking a second look at some cherished old favorites.